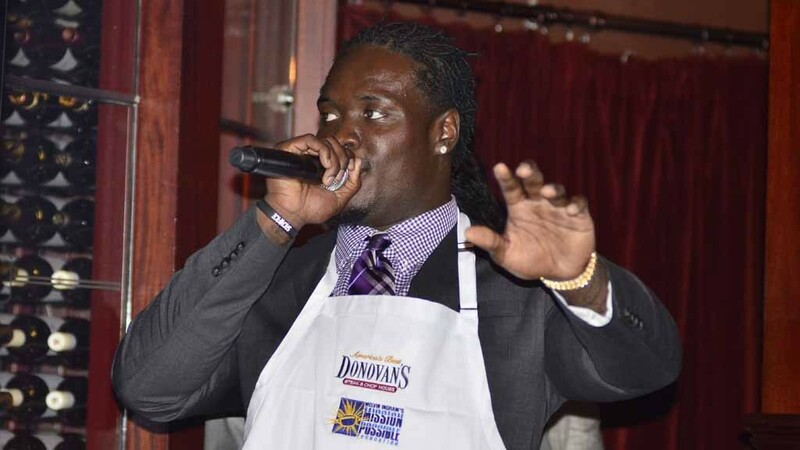 Melvin Ingram, an outside linebacker for the Chargers, was an inside leader Monday night at the upscale Donovan’s Steak and Chop House. Melvin Ingram thanks guests for attending and for their generous donations to his Mission Possible Foundation. 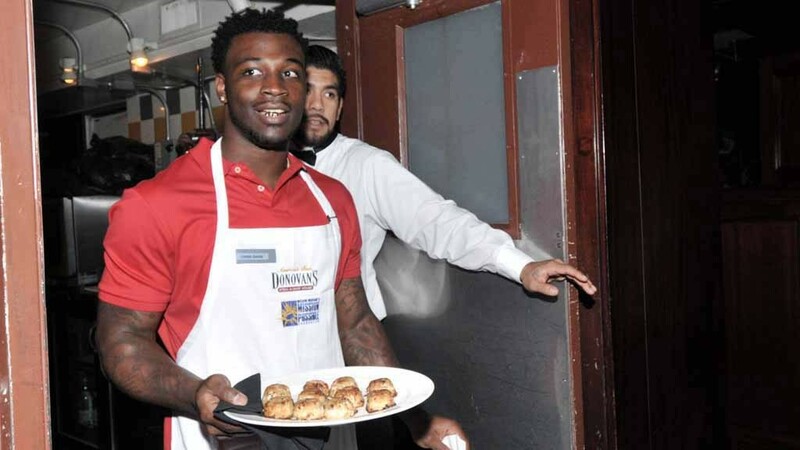 With a dozen teammates in tow, Ingram and crew served about 130 people, who paid as much as $350 each to feed Ingram’s year-old Mission Possible Foundation. 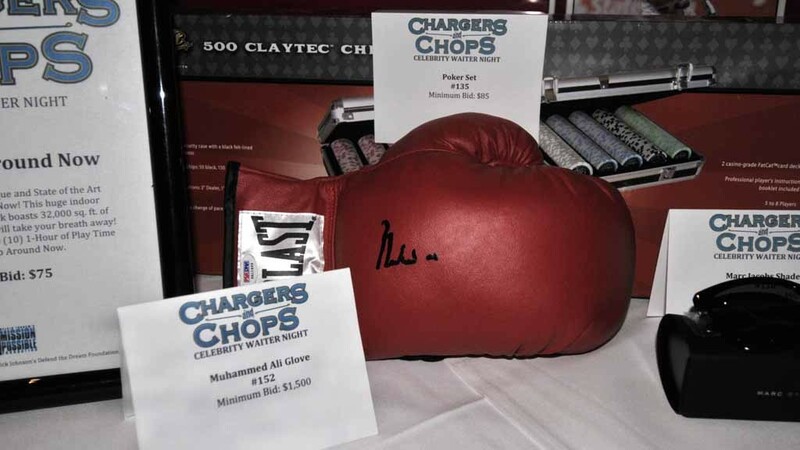 The first of a hoped-for annual Chargers and Chops served up four courses, wine and autographed items for bid including a Muhammad Ali-signed boxing glove. A Mike Tyson glove, too. A Gold Album signed by the Beatles was auctioned, as well as an NBA title ring and various trips and staycations. Ingram’s aim: To impact the lives of more than 30,000 at-risk San Diego students by the end of 2016. 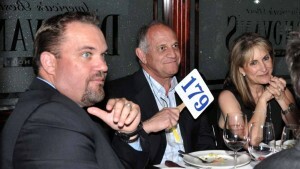 Guests paid as much as $350 to attend the fund-raiser and bid for auction items. Now 26, Ingram was the Chargers’ top draft pick in 2012 who missed most of the 2013 season with a torn ACL, returning in Week 16. He grew up in tiny Hamlet, North Carolina, and played for Steve Spurrier at the University of South Carolina. 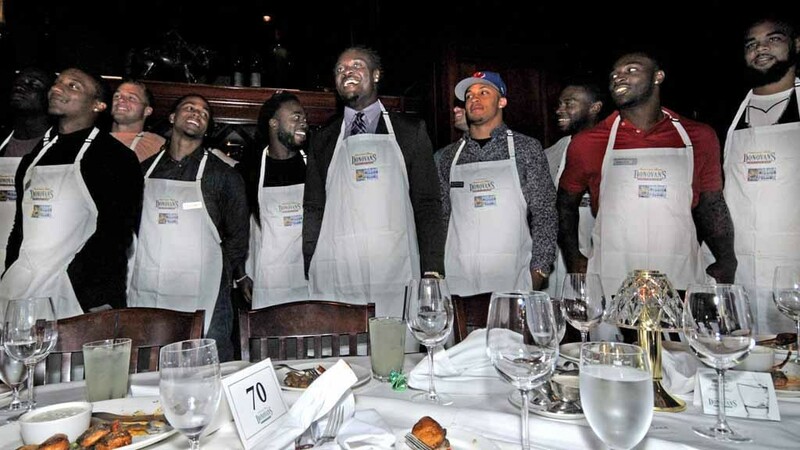 At 6-2, 247 pounds, Ingram was large for a waiter Monday night — but nowhere near the biggest. Also helping were 6-9, 330-pound offensive tackle King Dunlap and 6-3, 252-pound outside linebacker Jeremiah Attaochu. 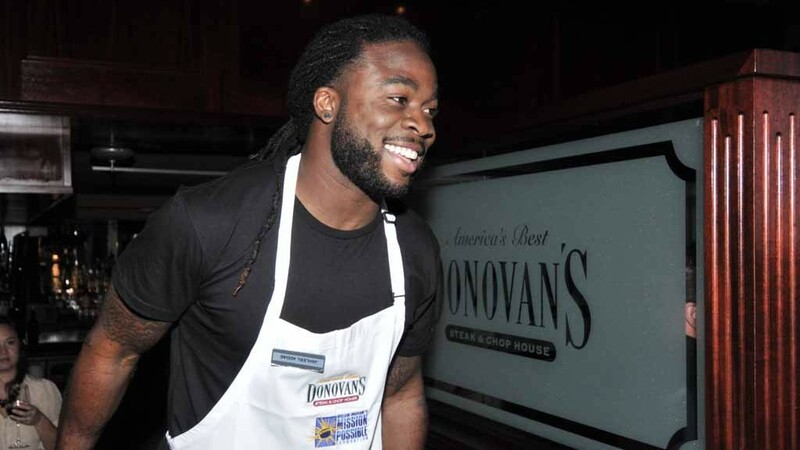 Other Chargers wearing aprons for the cause were Keenan Allen, Donald Butler, Chris Davis, Greg Ducre, Corey Liuget, Patrick Robinson, Manti Te’o, Colton Underwood, Jason Verrett and Tourek Williams. Jeremiah Attaochu is introduced to the more than 130 guests. 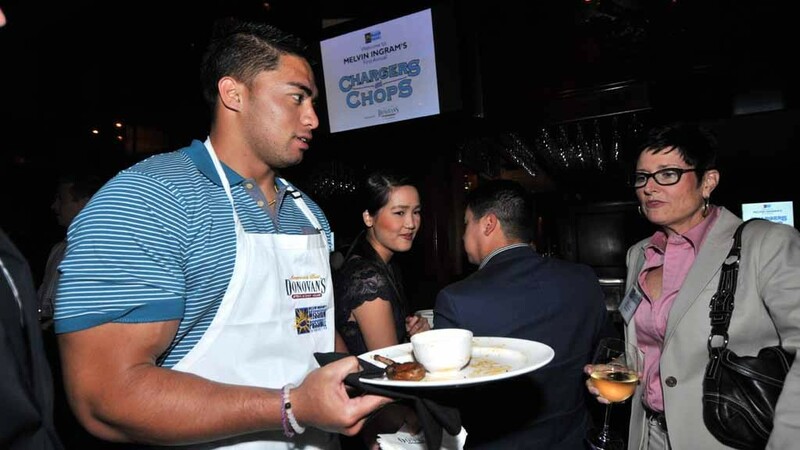 Manti Te’o serves hors d’oeuvres to guests at Donovan’s Steak and Chop House downtown. 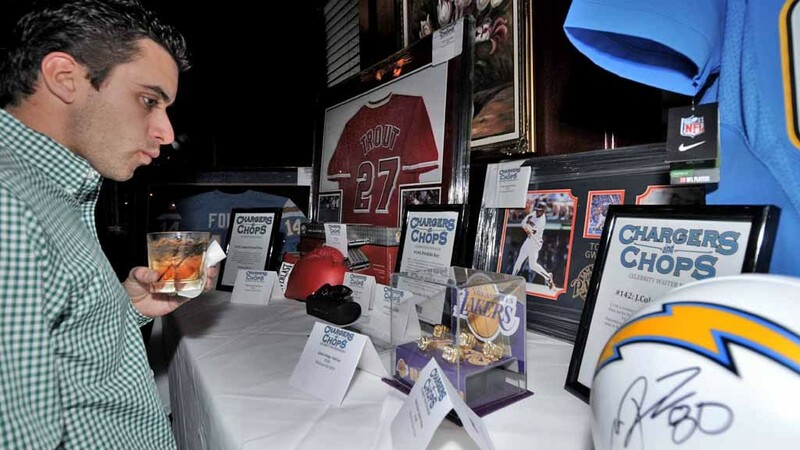 The Melvin Ingram fund-raiser included a live and silent auction. 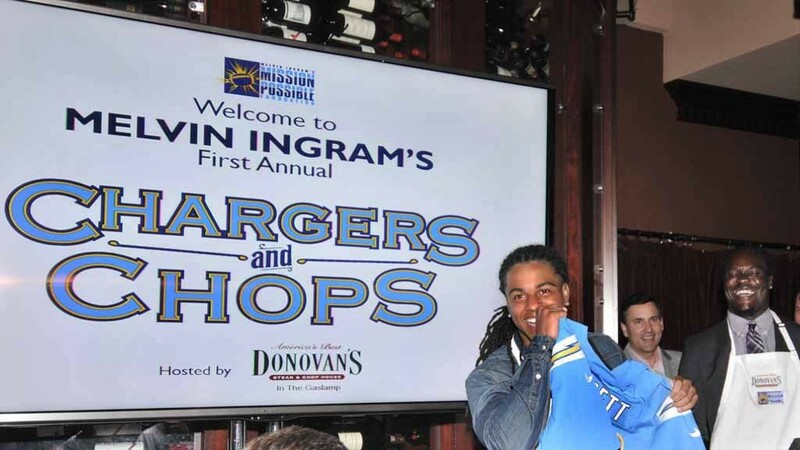 Melvin Ingram and about a dozen fellow Chargers assisted in raising money for the Mission Possible Foundation. 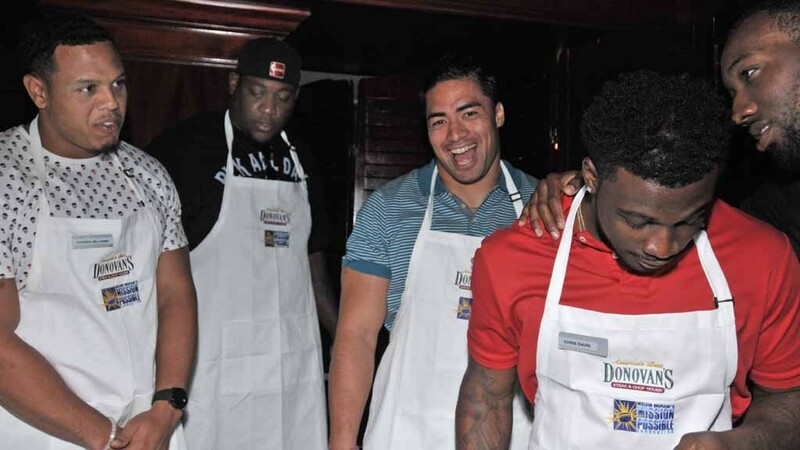 Chargers put on their aprons and get ready to sign auction items and pose for photos with guests. 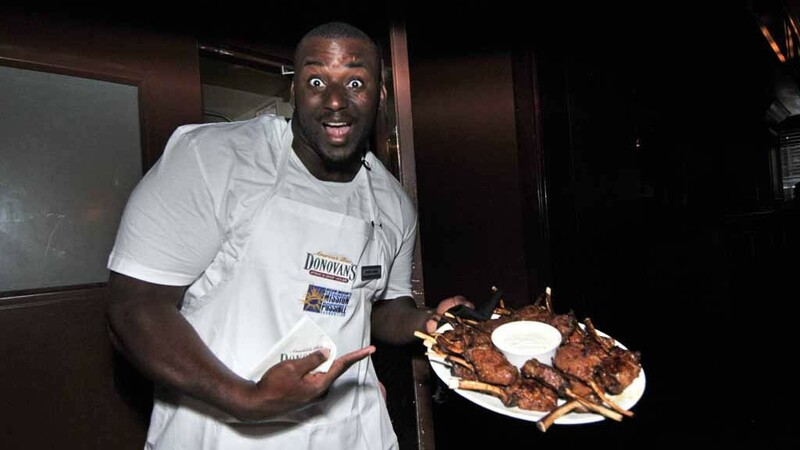 Charger Corey Liuget brings hors d’oeuvres from the Donovan kitchen. Jason Verrett holds up his signed jersey and the bidding begins. Guests paid as much as $350 to attend the fund-raiser and vote on auction items. Charger Chris Davis heads into the restaurant to serve guests. A boxing glove signed by Muhammed Ali was among the silent auction items. 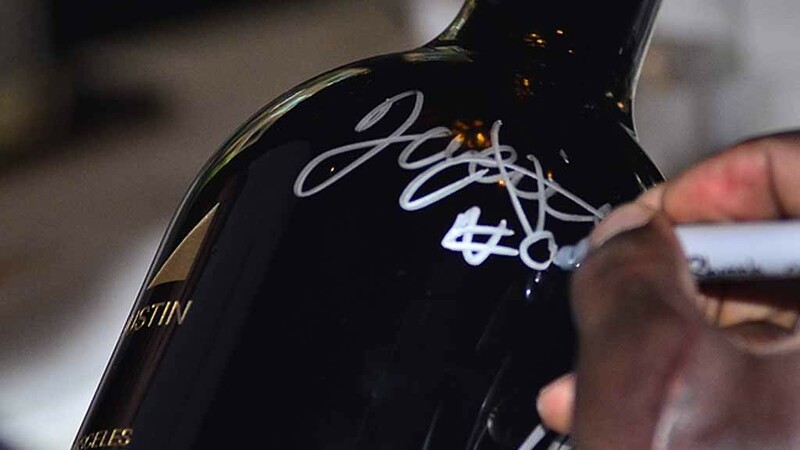 Charger Jeremiah Attaochu signs a bottle to be auctioned at the Chargers and Chops event.